The Health Estate Journal recently ran an article under the heading "Small investments, huge savings". It states that one of the key conclusions from the IHEEM Healthcare Estates 2014 conference was that basic energy efficiency measures could "shave millions of pounds from NHS estates' running costs", and that hospitals and other healthcare buildings face both "an air conditioning legal crisis", and a growing threat from outdoor air pollution. The whole article is very much worth a read, but one of the key statements is that there is plenty of "low hanging fruit" that any hospital can use to quickly, and cheaply improve energy efficiency. This last statement is so very true. Hospitals are a 24/7 operation and have a significant need for cooling which can be found at the heart of most HVAC systems. In a recent example we surveyed two separate cooling systems at the same facility comprising 1 x Alfa Laval Fin coil unit SCAG-8-5 and 4 x Carrier 09GHCA-178. The annual energy consumption for these cooling systems totalled 1,618,000 kWh which costs the trust just over £194K per annum to run. As you can see from the image below the horizontal coil faces were dirty with compacted dust, seed, pollen and other debris drawn into the fins. In a USA study by Pacific Gas and Electric they identified that 1mm of debris on a coil fin would cause a 21% drop in efficiency and increase energy consumption by as much as 30%. That is why this forward thinking trust contacted RABSE distributor Advantiv to solve the problem of coil clogging and reduce the cost of running their plant. 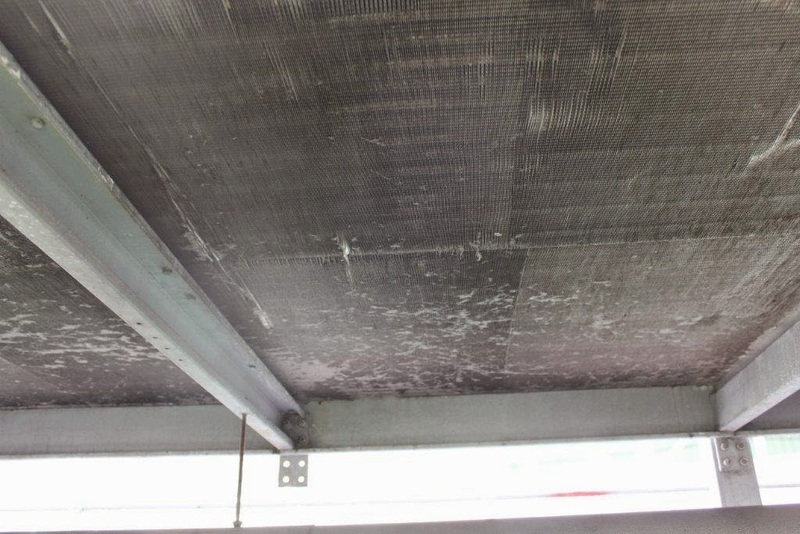 By installing an air intake filter screen to protect the coil faces, contamination will be significantly reduced as the cooling season progresses. The air intake screen is manufactured using a polyester core and polypropylene overlay which, during air movement, creates a static charge. This electrostatic charge easily captures the airborne particulate to PreVent® it getting through to the fins. No airflow, no electrostatic charge and this enables maintenance personnel to easily clean the air intake screens using a vacuum cleaner, hose or brush. By comparing with similar sites we would expect to see a minimum 10% reduction in running cost as the condenser is kept clean and efficiently rejects heat. The air intake filter screens were secured to the coil support steelwork using marine grade, nylon drop tab fastenings. In the event that access to the fins is required the screens can be easily removed and replaced. With an air resistance of only 17 pascals at 3.05m3/s this highly effective external filter will continue to protect the coils for at least 10 years and produce an ROI of less than 12 months. That leaves the trust with savings of at least £175K over the next 9 years and why we are proud to be saving money for the NHS.